Looks like our estimate of the Surface RT's price was right on the money. Microsoft just revealed that the Surface RT would retail starting at $499 without the keyboard cover. 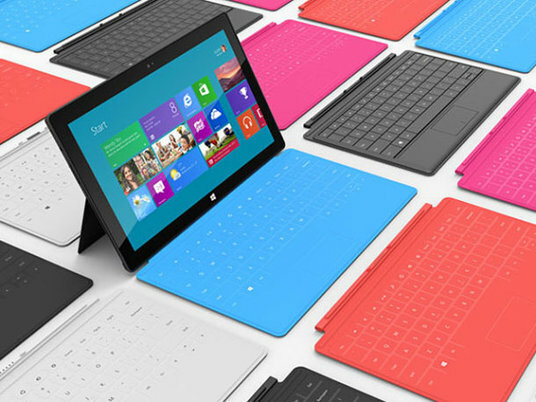 The keyboard attachment, which Microsoft has been marketing heavily, costs an additional $119-$129. Let's take a brief look at the market challenges facing the Surface RT. While the retail price of the 32GB Surface RT is $499, the price including touch/type cover (an essential accessory as per Microsoft's marketing efforts) comes out to over $600. At this price, it is unlikely that the Surface RT would be able to gain any traction in the market whatsoever. At this point, Windows RT basically has no application ecosystem to speak of. The only value offered by the Surface RT is the addition of a "Microsoft Office preview" which is unlikely to appeal to non-enterprise consumers. The Surface RT does not really offer any value proposition to consumers or fill any gaps in the market. This is actually my biggest concern, not just for the Surface RT but for all Windows RT based products. While Microsoft is going to spend billions on advertising the Surface and Windows 8, the ads only seem to focus on the new UI and the Surface's touch/type cover. Microsoft has made no attempt to educate consumers about the differences between Windows RT and Windows 8. In fact, Microsoft seems to be encouraging consumers to think about the Surface RT as a "PC Replacement" when it offers no legacy compatibility. This is going to lead to huge point-of-sale challenges and possibly even a high proportion of product returns. A disappointed consumer is very unlikely to consider a Windows RT based product again, especially given the price & ecosystem disadvantages. Conclusion - The Microsoft Surface RT and Windows RT based products in general will be handicapped in the market because of pricing and ecosystem/marketing challenges. Because of this, Surface/Windows RT's impact on the market shouldn't be any different from that of Windows Phone.